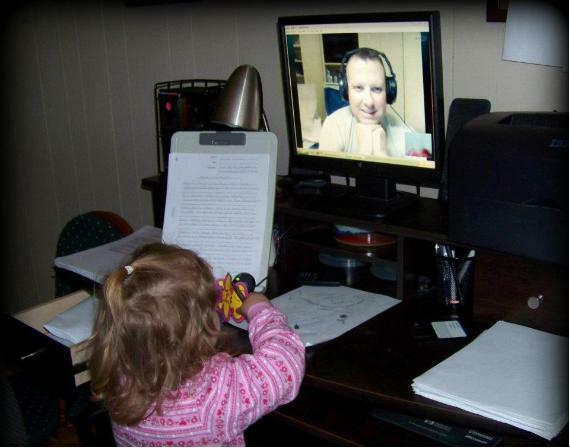 A friend on Facebook posted this picture of her three-year-old daughter talking to her dad today. The kid is adorable: a curly-haired moppet that you see from the back, proudly showing her daddy the picture she drew that day. Her daddy is a handsome man, smiling and clearly enjoying his daughter. The little girl, her older sister, and her mommy are all right here in North Carolina. Her daddy is in the Middle East somewhere, serving in the military. The wonder of technology lets them talk, and enjoy some sense of closeness during the holidays. It's not the same as being together - he won't be there to help put toys together (and for some reason girl's toys seem to need a lot of putting together), he won't be there to watch them unwrap their presents, he won't hold them in his lap at church on Christmas Day. They'll see his face and hear his voice, and that will have to be enough. I look at this picture and I know that it doesn't matter how I feel, personally, about any military action. How I feel won't make it possible for the Daddy in this picture to be with his family on Sunday morning. It won't make the separation easier for them. So, whether I support the decisions our politicians have made or not, I will support the men and women who have chosen to serve in our military...and know that there is no expression of appreciation that could possibly be enough. I'll be saying a special prayer for my friend this year, while she copes with a Christmas without her husband. I'll be praying for the families of all of the men and women serving in the military, who can't be together for Christmas this year. And I'll be giving thanks that we have families willing to make a sacrifice I can barely imagine, to serve our country. Thank you! This soldier is my wonderful brother! This is my first Christmas that I have not been able to hug him. I am so proud of him and love him so much, I will spend time with his wife and girls on Christmas and hold them close to me and feel his love through them. God Bless and keep all military members and their families in your daily prayers. Kristen - thank you for the loan of your brother! We moved far away from family, so I'm used to being separated...but it's much different when military service is the reason for the separation. Daily prayers go up, blessing rain down!